The Costume Institute's exhibition at the Metropolitan Museum of Art, Manus x Machina: Fashion in an Age of Technology explores how fashion designers are finding innovative ways of reconciling the dichotomy between hand (manus) and machine (machine). Rather than posit the two poles against each other, the show presents compelling examples in which traditional craft techniques and cutting-edge technologies are deployed as equal partners to stimulate the future of haute couture and avant-garde ready-to-wear. Curated by the Head Curator of the Costume Institute Andrew Bolton, the show features more than 170 ensembles dating from the early 20th century to the present, organized around the traditional métiers (trades) of dressmaking as outlined in Diderot's encyclopedia of 1751: embroidery, featherwork, artificial flowers, lacework, leatherwork, pleating, tailoring, and dressmaking. From Karl Lagerfeld's show-stopping embroidered wedding dress, Iris van Herbert's magnet-formed iron filigree ensemble, Hussain Chalayan's remote-controlled dresses on wheels and Issey Miyake's elaborate pleated structures—each example is shown on simple dress forms (like those you would find in a working atelier) which highlights the exquisite craftsmanship of each piece. The case study pieces are set against an ethereal installation by OMA's Shohei Shigematsu, a transparent scaffold that wraps around the circular Robert Lehman galleries creating the experience of a "translucent ghost cathedral"—a transcendental experience which is further augmented by a looping Brian Eno soundtrack. "Manus x Machina" is on view at the Metropolitan Museum of Art in New York through September 5, 2016. 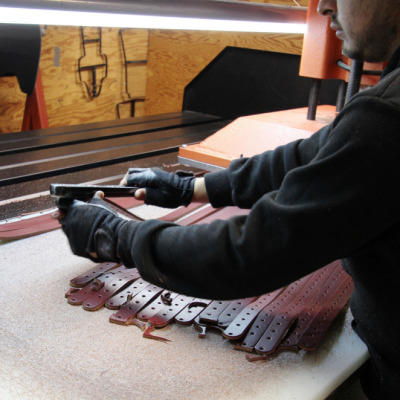 Factory Tour: How Occidental Leather Makes "The Best Tool Belts Money Can Buy"